The TT 15 track and train dog device with collar is a top-mounted, high-sensitivity GPS/GLONASS receiver that uses 18 levels of continuous and momentary stimulation plus audible tone and vibration activated from the Alpha 100. Compatible with the Astro 320 for tracking only. 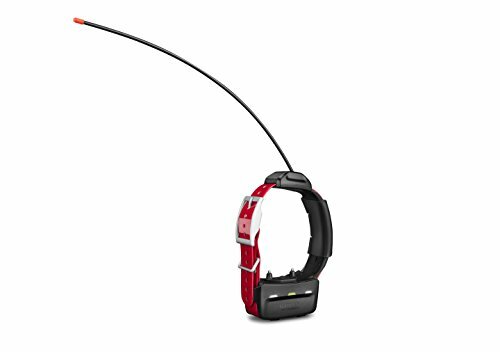 Rugged and water resistant to 10 meters, this tracking and training dog device is tough enough to run wherever your dog runs, up to 9 miles away. The stimulation features let you train each dog separately -traditional stimulation allows you to make quick changes(low, medium or high) within a predetermined stimulation level (1-6) whereas linear stimulation allows progressively more stimulation from levels 1 to 18.TT 15 units, when sold separately, ship with a 1-inch red collar strap. Replacement straps are available in multiple colors (sold separately). LIGHTER WEIGHT - TT 15 mini is lighter in weight (7.5 oz.) compared to the standard TT 15 dog device (10.0 oz.). COLLAR SLEEP MODE - Allows you to save the battery life on your dog device by turning on the sleep mode feature from the handheld. 3/4" COLLAR STRAPS Compatible with 3/4" polyurethane-coated nylon collar straps; multiple colors sold separately. LONG & SHORT CONTACTS - Includes 2 lengths (long and short) of removable, stainless steel, insulated contact points for reliable performance in wet conditions and extended comfort for the dog.